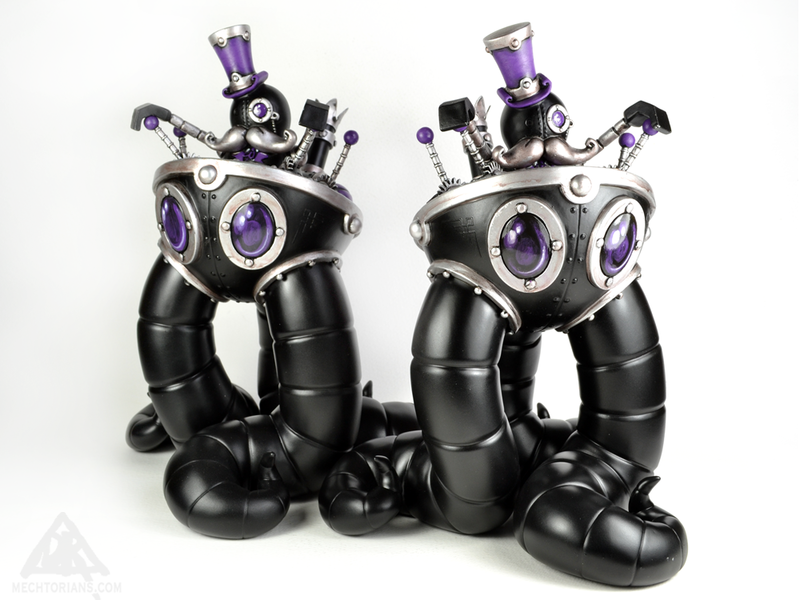 As a treat for collectors at ToyconUK this weekend I have created two special Perambulators. 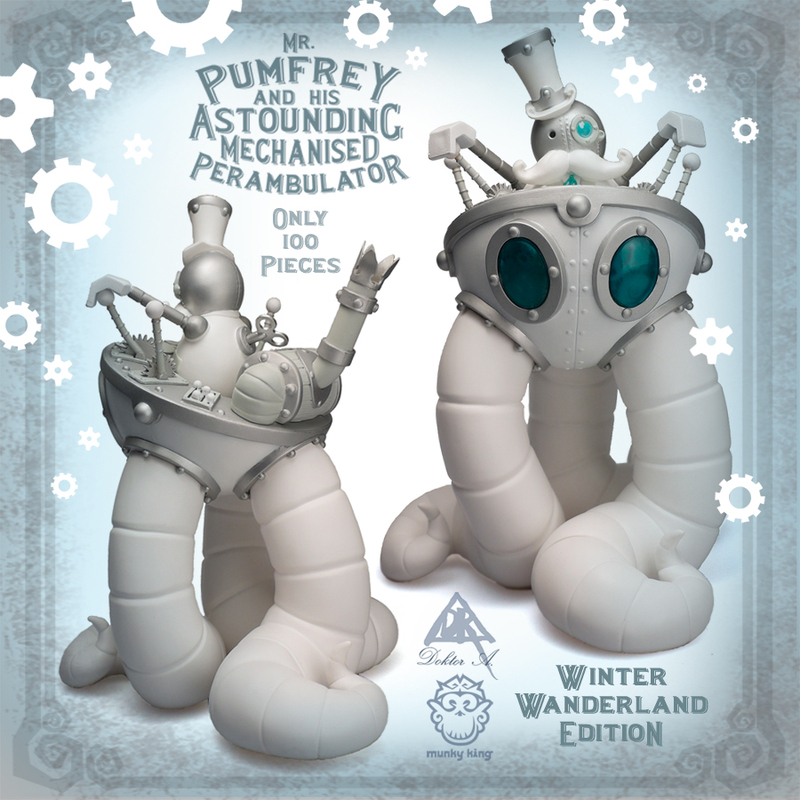 Approach of the White Walkers…..
Mr. Pumfrey and his Astounding Mechanised Perabulator – “Winter Wanderland” edition is due for release at Designer Con in Pasadena this coming November 9th & 10th. 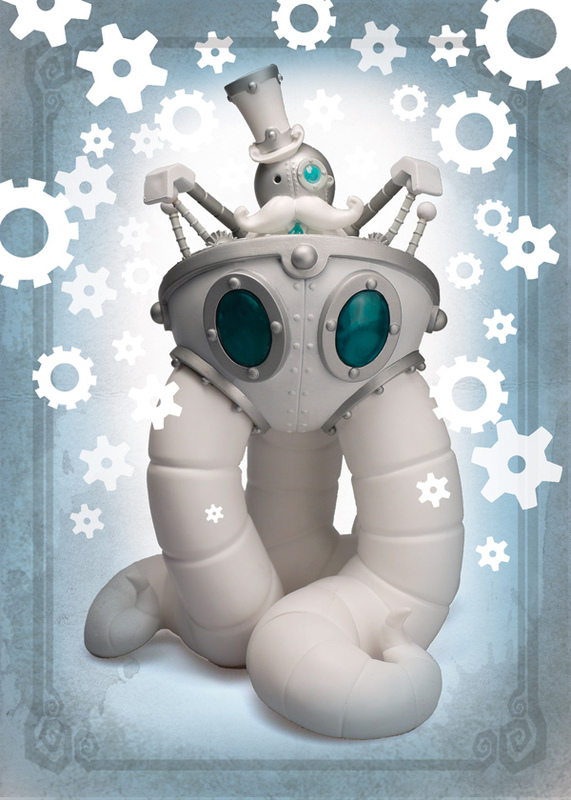 Only 100 of this second colourway of the retrobotic conveyancer will be produced by the sterling Munkyking company. 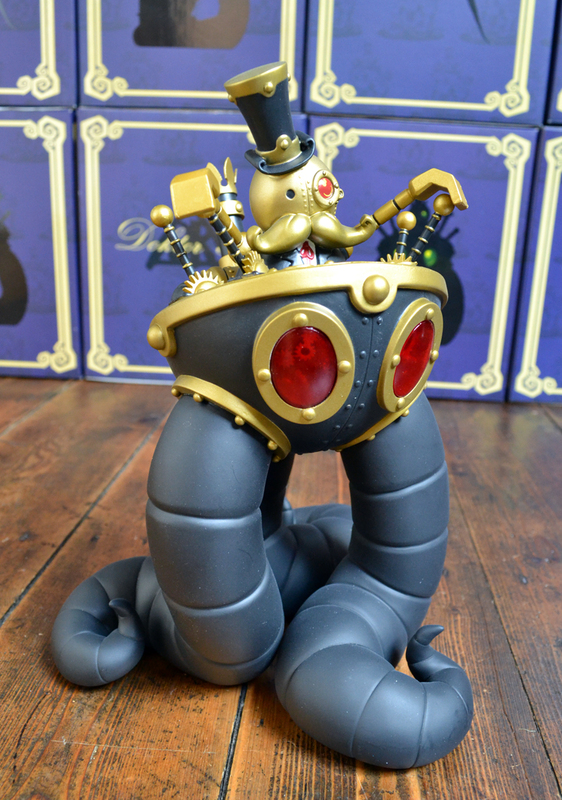 Eight inches tall with a removable pilot the, the original “Autumn Amble” version is now sold out. 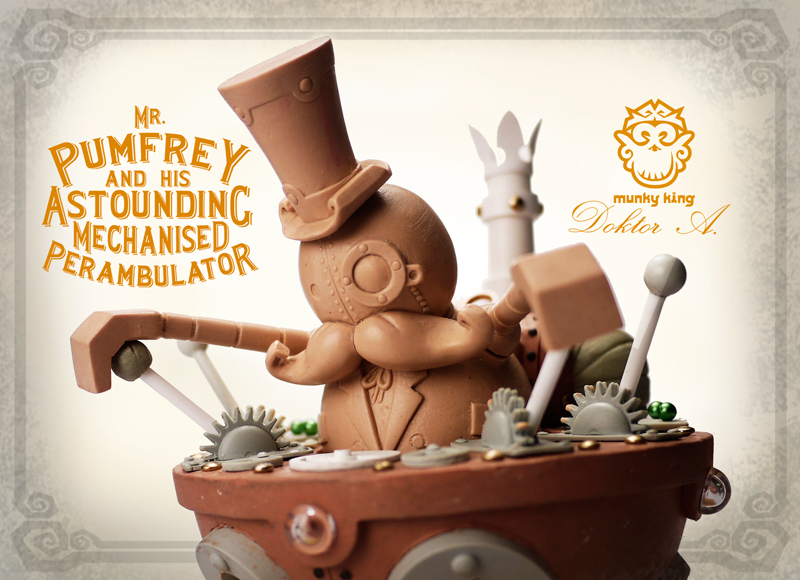 Mr. Pumfrey and his Astounding Mechanised Perambulator. 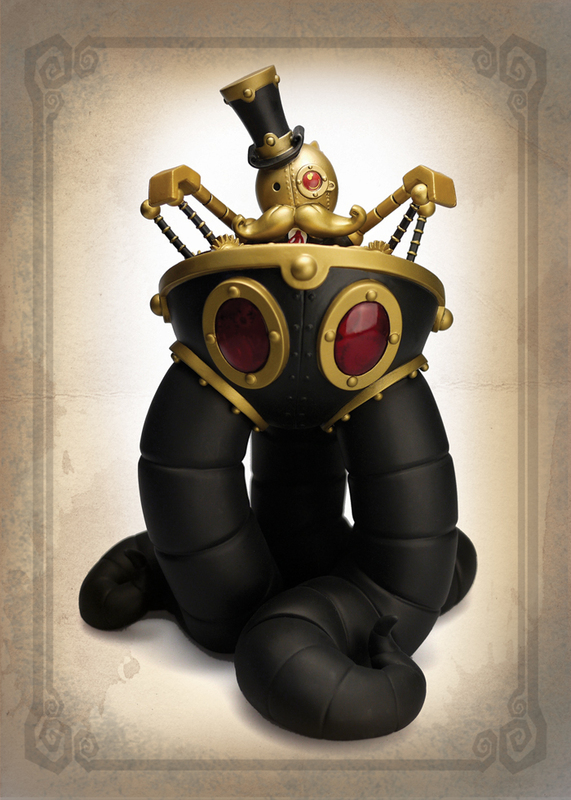 A new toy designed by Doktor A and crafted by Munky King. A Behemoth of robotic motion. The perambulator seems to stride on organic looking mechanical tentacles with Mr. Pumfrey perched in his lever, dial and switch crammed control seat. The mechanism’s internal working visible through it’s transparent red eyes. 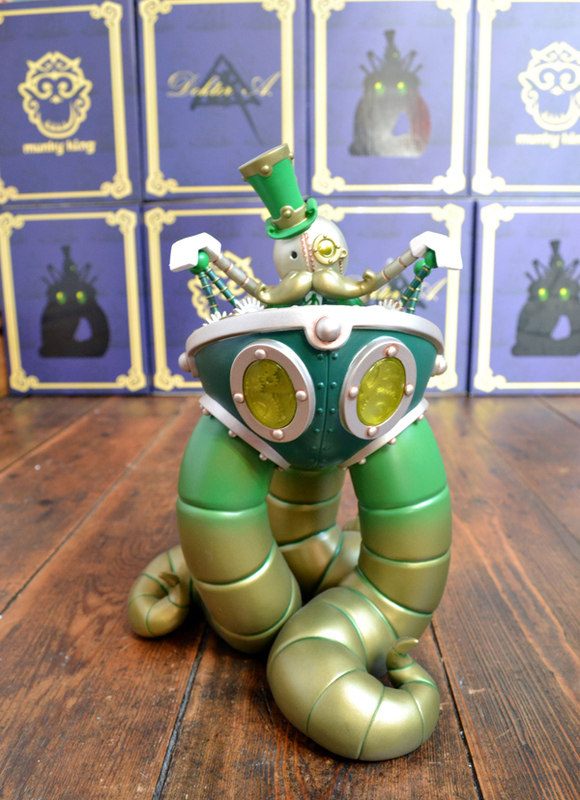 The “AP”s of this toy are now available direct from Doktor A from his online store. In a total edition of 100 for this black, gold and red colourway, this is the signed and numbered edition of 15 “APs” ( Artist Proofs or Artist’s Percentage). 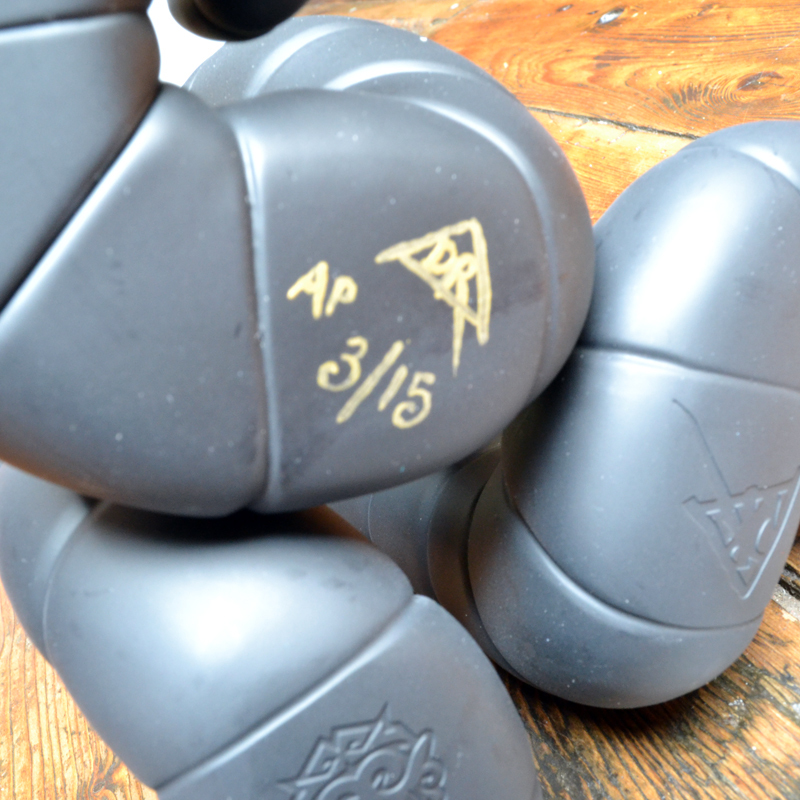 Each piece is signed and numbered on the underside of one tentacle in gold acrylic paint. 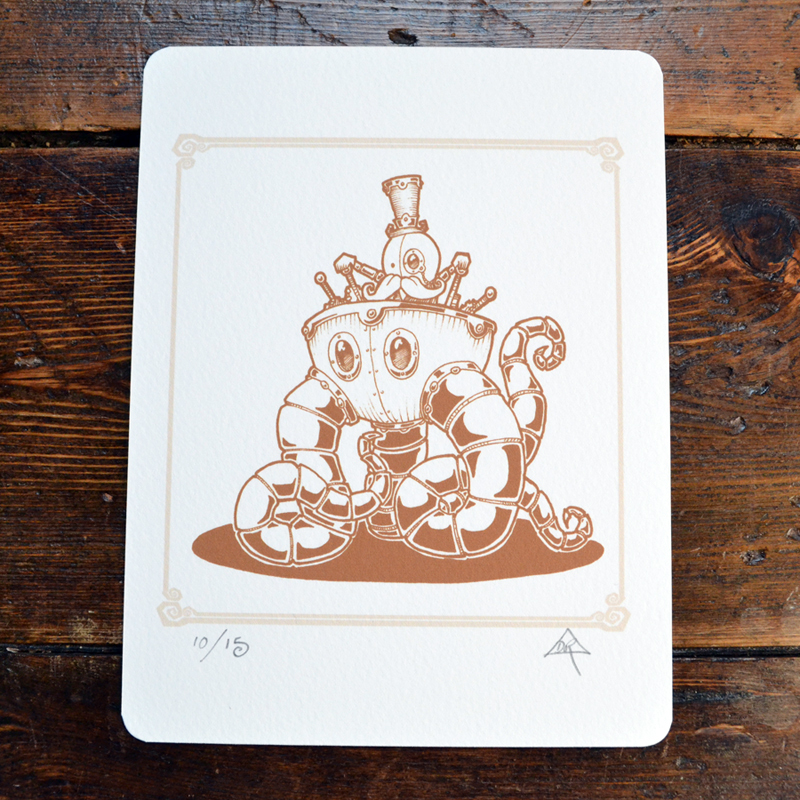 Each Ap also comes with a signed and numbered mini art print of the original ink drawing that inspired the toy (same edition number as the AP). 4.5″ X 5.5″ on heavy archival rag stock. And a full colour promotional postcard. 8″ tall, rotocast static vinyl display figure with removable Pumfrey pilot. Comes in a presentation box with inner clam shell packaging. 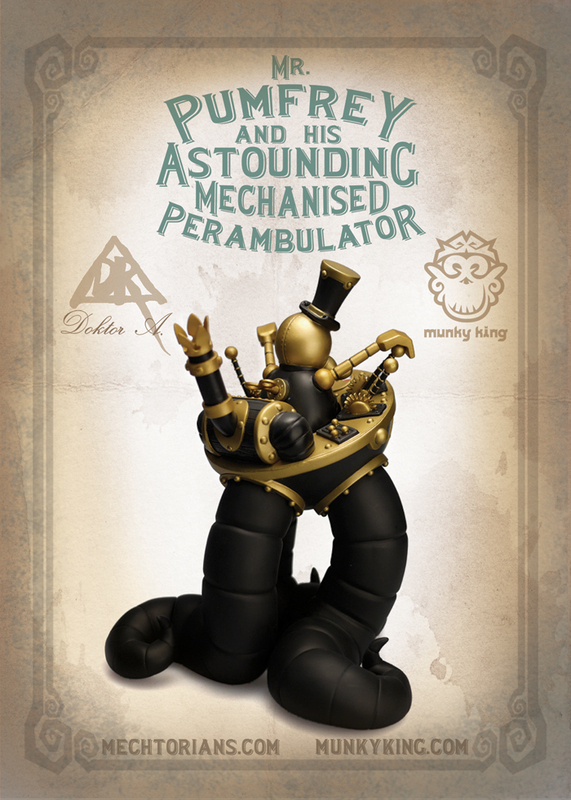 Introducing Mr. Pumfrey and his Astounding Mechanised Perambulator. 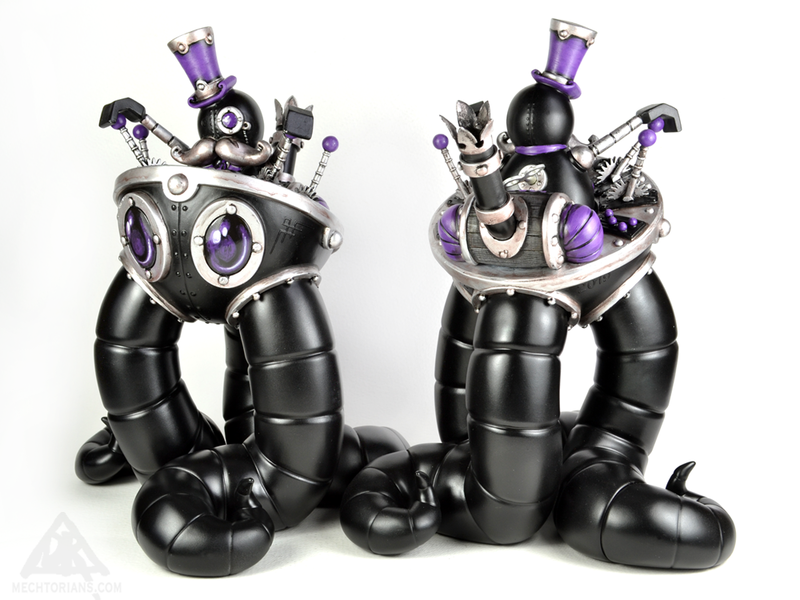 A new vinyl Mechtorian art multiple from the mind of Doktor A and the production expertise of Munky King. 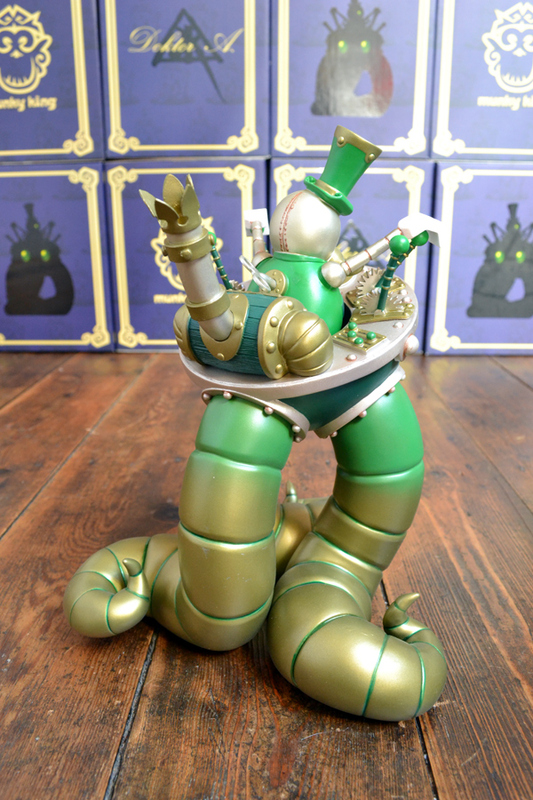 Sculpted by the infamous Dave Pressler and Julie B of Pretty In Plastic, this mechanised behemoth is the most complex Mechtorian toy to date. Levers, gears and dials cram the cockpit of the perambulator into which the removable Mr. Pumfrey sits. Transparent red eye lenses reveal the inner mechanism of the betentecled 8″ tall Perambulator. This is the “Autumn Amble” edition of 100 pieces. Black, gold and red. To be released at San Diego Comic Con this July, direct from the Munky King booth. New toy in the works.. This is a glimpse at an early wax work in progress sculpt by Dave Pressler.